http://media.blubrry.com/w2l7/p/media.blubrry.com/noodlemx/p/welcometolevelseven.com/wp-content/podcast/WTL7_186DD.mp3Podcast: Play in new window | DownloadJoin Stewart and Samantha for a rooftop conversation about vigilantes and justice in “New York’s Finest”, the third episode of Daredevil’s season 2! http://media.blubrry.com/w2l7/p/media.blubrry.com/noodlemx/p/welcometolevelseven.com/wp-content/podcast/WTL7_185DD.mp3Podcast: Play in new window | DownloadIt’s Punisher vs. Daredevil! Foggy vs. the district attorney! Karen vs. her own inner doubts! And it’s explosive! Ben and Stewart talk about it all! http://media.blubrry.com/w2l7/p/media.blubrry.com/noodlemx/p/welcometolevelseven.com/wp-content/podcast/WTL7_184DD.mp3Podcast: Play in new window | Download Daredevil returns! Well, RETURNED. A while ago. But we’re finally getting to it! There’s a new vigilante in town and we’re introduced to a new character in the MCU: Punisher! 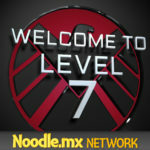 http://media.blubrry.com/w2l7/p/media.blubrry.com/noodlemx/p/welcometolevelseven.com/wp-content/podcast/WTL7_115.mp3Podcast: Play in new window | DownloadAnother awesome episode of Daredevil brings us a number of people who were left behind! Wesley leaves Fisk behind . . . Foggy leaves Karen behind . . . Matt leaves Karen behind . . . Fisk leaves his mother behind . . . Ben leaves EVERYONE behind! http://media.blubrry.com/w2l7/p/media.blubrry.com/noodlemx/p/welcometolevelseven.com/wp-content/podcast/WTL7_109.mp3Podcast: Play in new window | DownloadIn Daredevil’s “Shadows in the Glass,” Kingpin’s origin is front and center…and so is Wilson Fisk! A companion episode to “Stick”, does it impress? Find out here!